eBay provides Rs.100 off on your first purchase from eBay.in. eBay is currently providing many loudest diwali offers. You have to purchase for a minimum value of Rs.110 to get Rs.100 off. So, you will be paying only Rs.10 finally for the product worth Rs.110. This offer is applicable for only users who receive the email from eBay.in. 1. Visit eBay.in offer page from your mail. 2. 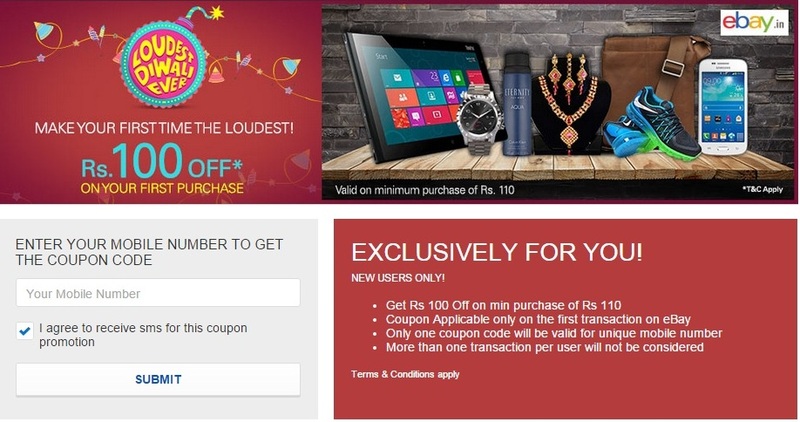 You get Rs.100 off on a minimum purchase worth Rs.110. 3. Offer is valid only for people who received email from eBay. 4. Only one coupon code is valid for one mobile number.